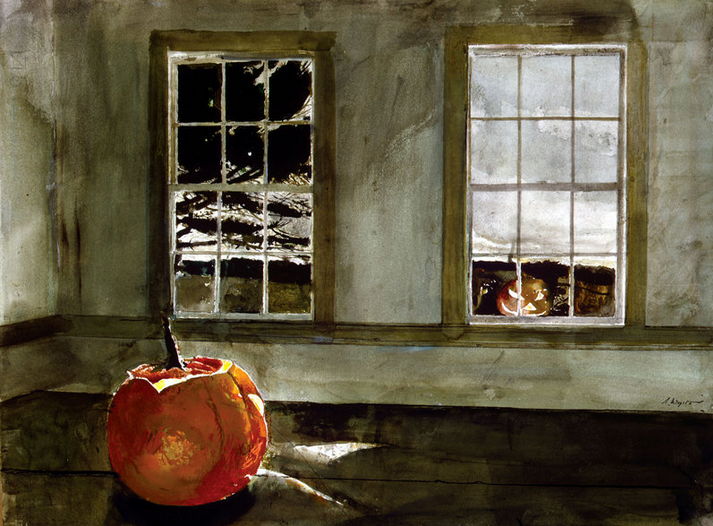 I easily chose Jamie Wyeth for my series ArtistZ - although I worship the three generations of the Wyeth painters, N.C., Andrew and Jamie equally. 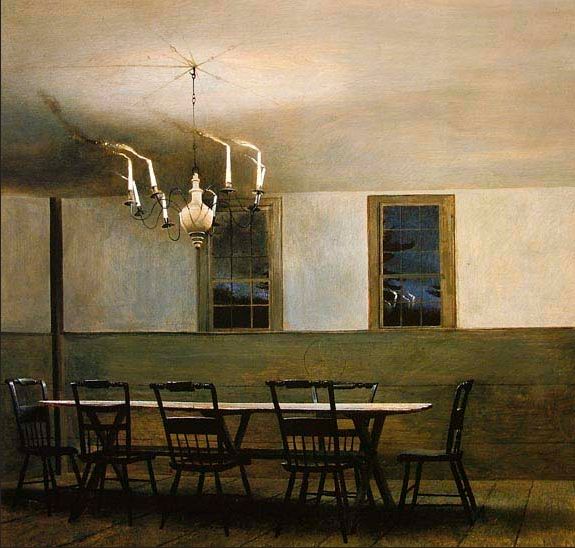 Something about growing up in Bucks County, Pennsylvania with a mom who painted - many Sunday drives through nearby Delaware County where the Wyeths lived and painted - all of that must have made an impression on me. They made my want to be an artist. 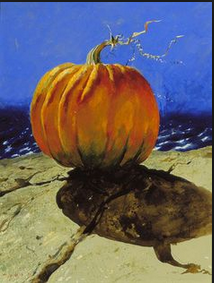 I also chose one of my personal favorite paintings by Jamie Wyeth titled 'Pumpkinhead (Self Portrait)'. 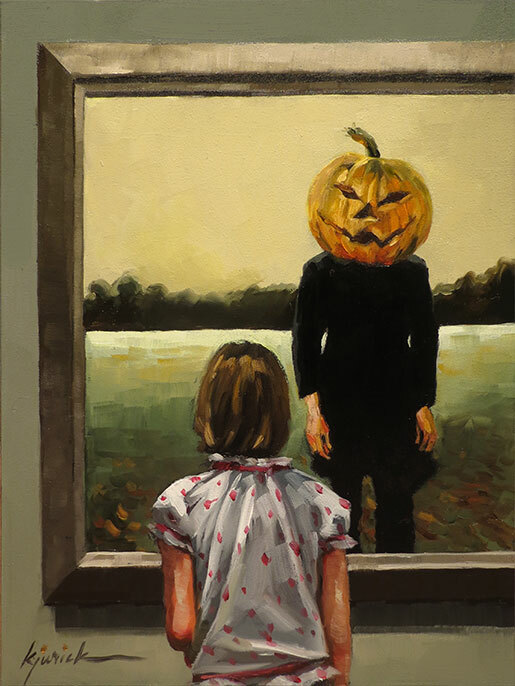 It has always spooked me, even when I was painting my piece. 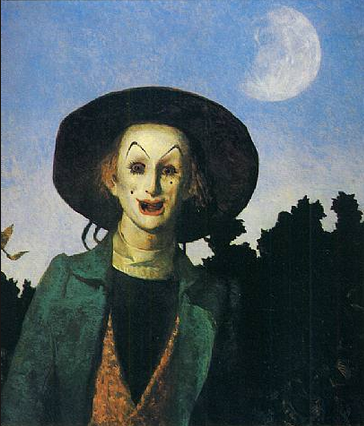 In a past interview, Jamie told this story - 'I had been elected to the National Academy of Design in New York, and one of the requirements was that you give a portrait, a self-portrait of yourself. 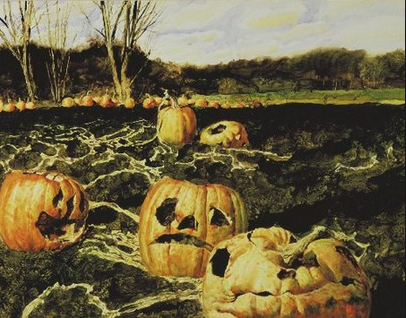 Well, I didn't want to do myself in a self-portrait, but I love pumpkins. 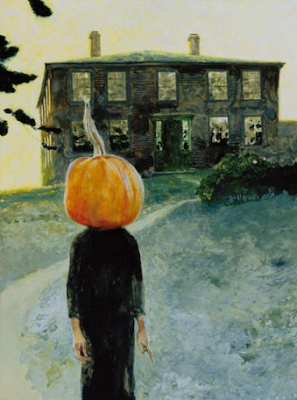 It's the sinisterness, the Halloween I've always loved. It's a bit edgy. So I did it and of course they were furious and rejected it.' 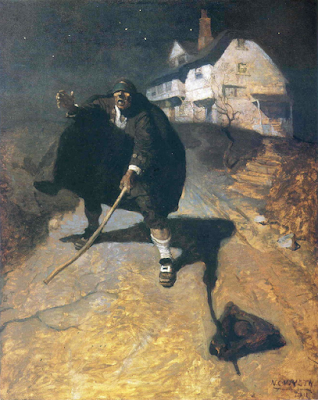 Imagine anyone rejecting a Wyeth painting? 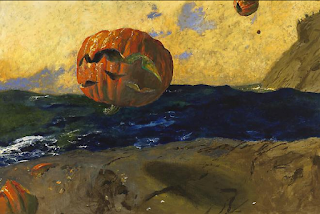 N. C., developed the same love for Halloween. 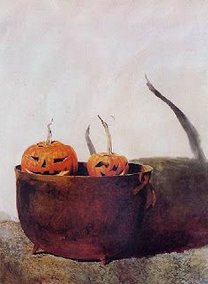 'Wyeth has made Halloween a personal Walpurgisnacht, an annual reconnection with the unearthly, with witchcraft and hidden meanings. On that day he is electric with fun. He picks the deformed pumpkins and carves them into jack-o'-lanterns, a long lineage of fantastic death masks summoned up from childhood by the remembered scent of candle-heated pumpkin flesh.' 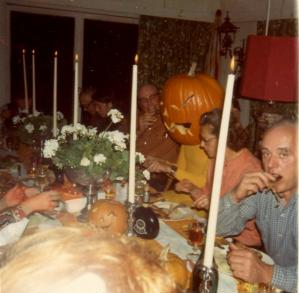 I read that the family had a long tradition of wearing their costumes for dinner on Halloween night - here's a photo where you can see Jamie on the right. 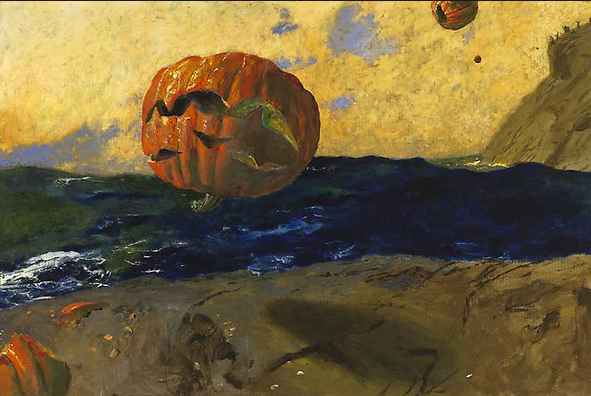 and a Happy Halloween to you. Exceptional post, Karen! Very fascinating! Thanks for a totally enjoyable post and a view of your 'perfect' painting! she did. Like you I am a admirer of the Wyeth artists. What talent. but I thank you for it. You showed me some old favs I had neglected for a while.